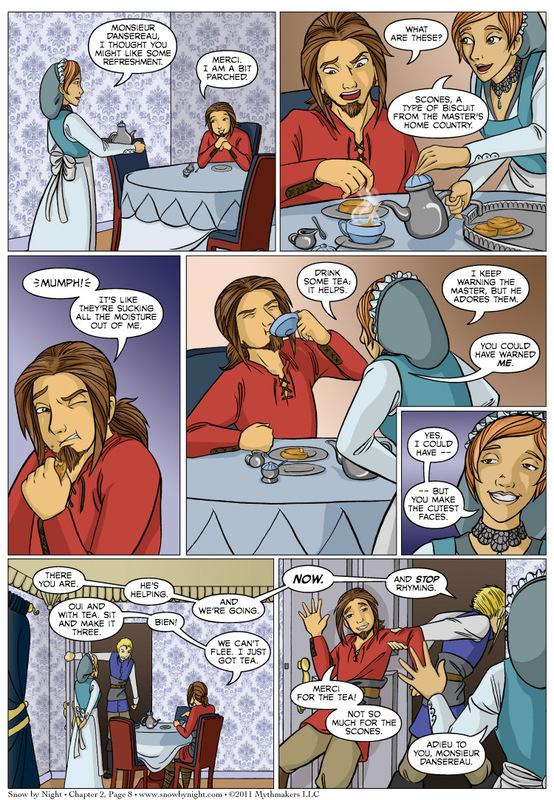 Chapter 2 Page 8 is up.The action switches back to Blaise and we find out how he is spending his time at Cienan’s house. I’ve recovered (mostly) from Otakon. It was an incredible show with more than 31,000 attendees. Thousands of people streamed by our table in Artists’ Alley, and Brittany and I spoke to hundreds over the weekend. To those who stopped by, said hello, and listened to us talk about our comic, thank you! We also got a chance to meet some artists. We sat by Erin McManness who makes incredible illustrations and jewelry. I got to hang out with Shazzbaa of Runewriters and Stephanie Stober of Final Arcanum. I also met an incredible artist – Dirk Tiede of Paradigm Shift. His comic of paranormal action/horror is one of the best I’ve read. And no convention is complete without Jennifer Zyren Smith of LaSalle’s Legacy. Her story is firing on all cylinders. Go check it out. I’m uploading pictures from the convention to our Facebook page. Please take a look! And a new incentive is up on Top Web Comics. Give us a vote to see Blaise and Jassart’s attempt at angelic faces. is it just me, or is Jassart really skinny? He doesn’t seem to have very broad shoulders either- maybe I’m just seeing things. Also, Cienan needs to be introduced to scones with a higher fat content; they provide at least the illusion of moisture. Bacon works well, especially with cheese. Also, been binging through Paradigm Shift. Thanks for the suggestion! That comic also hates scones. Is it me or is the offer of refreshments more than just looking after a guest in this case? So not just you. Though Blaise is, of course, oblivious to the fact. Is Blaise ever not oblivious to such facts?